Unroll and spread 1/2 of the can of crescent rolls on the bottom of an un-greased 8x8 pan. Soften the cream cheese in the microwave for at least 1 full minute on high, must be very soft, almost melted. Add the package of Snickerdoodle Mix to the cream cheese and stir well. Spread the Snickerdoodle mixture over the layer of crescent rolls. 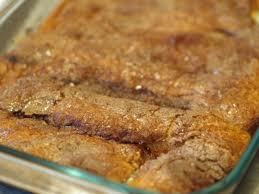 Unroll and spread the remaining 1/2 can of crescent rolls over the snickerdoodle mixture. Melt butter in microwave and drizzle over the top layer of crescent rolls.